6sqft marveled earlier this summer at the utter coolness of the two-unit, three-story property that atop the building at 72 East 1st Street in the East Village. 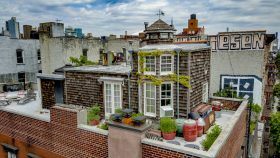 The unit arrived on the market for $3.5 million in June; its top floor is comprised of one of the city’s handful of rare rooftop cabins and cottages. The Nantucket-style cottage is an artists’ studio, with a full-floor penthouse duplex below. Rare and cool clearly count for a lot, because the property has already entered contract at its asking price according to the listing site (h/t Curbed). The listing calls the two-unit, three-story property that tops the condominium building at 72 East 1st Street “the most unique property in the East Village,” and while it may not be the entire city’s most interesting, it’s definitely among them. The lower unit is a full-floor penthouse duplex, above which is perched a perfect replica of a New England cottage. The property is for sale for $3.5 million; while much has been written about the city’s handful of rooftop cabins and cottages, they rarely appear on the market. In this case, the Nantucket-style cottage is an artists’ studio, which makes it even cooler.